Portugal may not be out of the World Cup yet, but they sure got very close to already have to accept that fate tonight in Manaus. In a game where Paulo Bento's men failed once again to perform at the level that is expected from them, the "Selecção" managed to keep themselves alive in this tournament and all thanks to a late and dramatic goal from Silvestre Varela, who set the final score in 2-2, inside the 5th minute of stoppage time. There might not be much left for Portugal in this World Cup, as tonight's 2-2 draw against the USA have substantially narrowed the Portuguese options of still advancing from this tournament's Group G. The lack of intensity and a very poor display from most of the players on the pitch was once again the dominant note for Paulo Bento's men, who are now forced not only to win against Ghana next Thursday, but also hope that the USA loses against Germany. 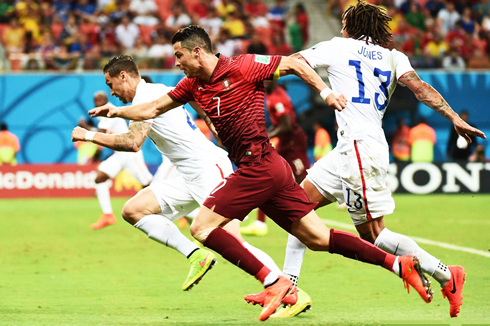 Moreover, Portugal must also finish with a better goal-average than the Americans and having in mind they are currently set apart with a 5-goal difference, the task will be extremely hard to accomplish. Before those two thrilling games take place later this week, tomorrow we'll already see the first two groups (Group A and Group B) coming to a closure. The more entertaining matches are likely to be that Brazil vs Cameroon where the hosts will try to secure their passage to the last-16 stage, and also a Netherlands vs Chile that will decide who wraps up the first place in that high caliber group where Spain has already fallen. 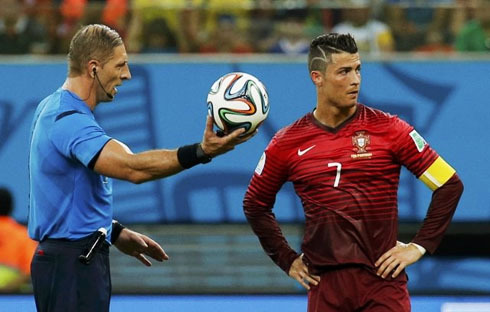 As Portugal prepared for this game against the USA, Paulo Bento already had several changes in mind. However, the defense sector was the one that more problems arised over the last few days. Beto replaced Rui Patrício in the goal, while André Almeida took Fábio Coentrão's spot as left full-back and Ricardo Costa filled in for the suspended Pepe. Bruno Alves and João Pereira were the only two players from the back that got to repeat their presence in the starting line-up. The midfield was exactly the same as in the game against Germany, with Miguel Veloso holding the line in front of the defense, and João Moutinho pairing up with Raúl Meireles in the center of the field. In the attack, Cristiano Ronaldo and Nani welcomed Hélder Postiga to the striker position, who came in to replace the also injured Hugo Almeida. Portugal actually got off to a good start in Manaus and an early goal from Manchester United's Nani delivered the "Selecção" the first lead in the game. We were still inside the first 5 minutes of the encounter when a poor cross from Miguel Veloso on the left saw an even more poor clearance from the United States center defender Geoff Cameron, all leading to a bouncing ball just a few meters behind the American player and where Nani was patiently waiting for it. The 27-year old winger controlled it down, kept his composure as he had only Tim Howard standing in front of him and then finished it off to put Portugal in the driving seat of this very important game. The early goal may have probably influenced the type of game we ended up getting afterwards, as it were the United States who ended up having more ball than Portugal, at least until the equalizer arrived deep in the second half. 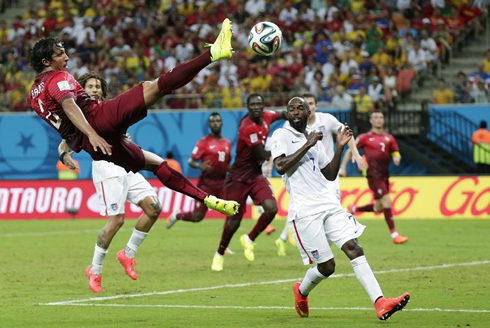 In the 64th minute of the game and following one of the several corners that Jurgen Klinsmann's men have earned during the encounter, a bouncing ball coming from a Nani header fell on Jermaine Jones feet, with the North-American player still standing about to 25 to 30 yards away from goal. Nevertheless, the Besiktas midfielder decided it was a good opportunity to showcase his long-range shooting skills though and by curling the ball into the far post with great technique and power, he beat Beto for the first time on the night and finally put the USA on the scoreboard. The Portuguese Team was showing a lot of difficulties to hold off the Americans attacking intents, which became even more evident when Paulo Bento decided to play Miguel Veloso as left full-back, following André Almeida's departure from the game during the half-time break. It was precisely from one of those many USA attacking plays through the Portuguese left corridor that the Americans' ended up reaching their second goal. We were in the 81st minute of the game when Miguel Veloso left a huge gap on his back for his opponent to exploit, which then allowed for a dangerous cross to be made and a rebound ball to fall to Zusi. The Kansas City midfielder was kind enough to deliver a quick assist to Clint Dempsey in the center and the Americans' undisputed best "soccer" player, unorthodoxly resorting to his hip, touched it in right into to the back of the net, granting USA a highly precious 1-goal lead. The Seattle Sounders forward had already scored one of the fastest goals in the World Cup history in his opening game against Ghana and he somehow managed to deliver it again for his nation tonight, this time against Portugal. 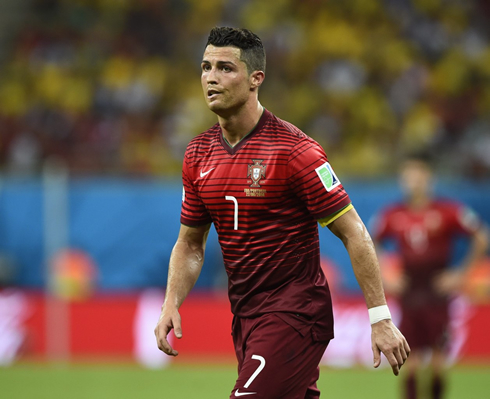 It all seemed lost for the "Lusitanos" and without any further changes in the scoreboard, Portugal was about to be saying a definitive goodbye to this 2014 FIFA World Cup in Brazil. 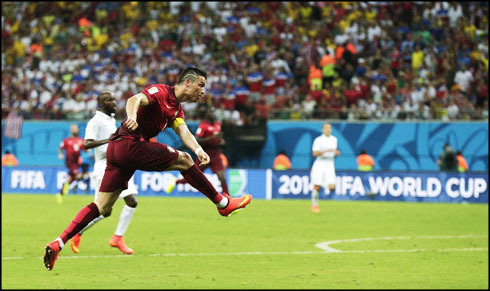 However and in one of the few plays where Cristiano Ronaldo got to show up in this game, Portugal reached to a dramatic equalizer in the very last minute of stoppage time. The Real Madrid superstar sent in a perfect cross into the USA box and then he saw Silvestre Varela coming from behind at the far post to head it past Tim Howard. The FC Porto midfielder didn't waste such a golden opportunity and he got to set the final score in 2-2. With this draw, Portugal still has some very slim hopes of advancing into the next round of the competition, but they'll need to beat Ghana on Thursday and hope for a Germany win against the USA. Not only they'll need that combination of results, but they're also forced to cancel the 5-goal deficit that comes from the two teams' goal-average (Portugal and USA). Attackers: Cristiano Ronaldo, Nani, Hélder Postiga. 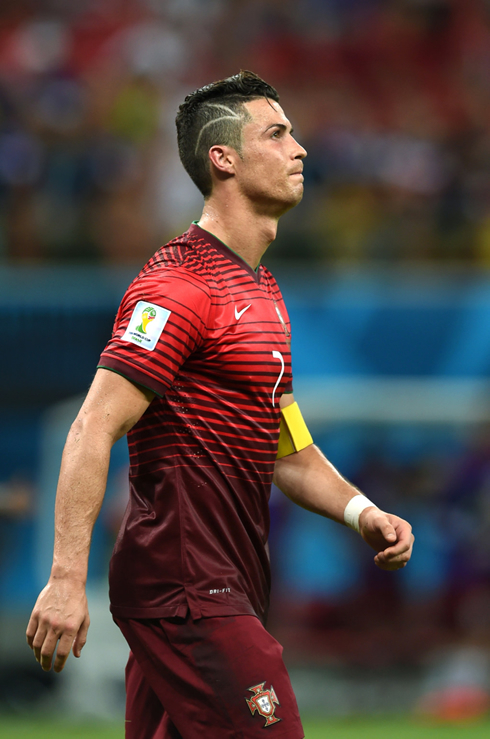 Cristiano Ronaldo's next game will be his third fixture in the FIFA World Cup, on a match between Portugal and Ghana, scheduled for June 26 of 2014, in Brasília (Brazil). You can watch Juventus live stream, Portugal vs Ghana, Spain vs Australia, Brazil vs Cameroon, and Netherlands vs Chile, all matches provided from our FIFA World Cup streaming game pages.